DETROIT -- A fire that ripped through a supplier’s plant in Michigan has disrupted auto assembly at several factories, including Fiat Chrysler Automobiles Canada’s Windsor Assembly Plant, where the Chrysler Pacifica minivan is built. FCA said on Wednesday it is "adjusting production schedules as needed to minimize plant downtime [and] will make up any lost production." Unifor Local 444 President James Stewart, who represents workers in Windsor, told the CBC there is no set amount of time each shift is running. Meanwhile, Ford Motor Co. said production of F-150 and Super Duty pickups at multiple U.S. factories will be halted this week because of a fire at a supplier plant that produces instrument panels for the trucks. General Motors and Mercedes-Benz also reported production disruptions. Production of Ford's most profitable vehicle could be knocked out for several weeks in the wake of last week's fire that interrupted production at the Meridian Magnesium Products of America plant near Lansing, Mich., a person familiar with the situation told Bloomberg. Output of F-150 pickups at the Ford plant in Dearborn, Mich., could be idled Wednesday or Thursday, people familiar with the situation told Reuters. A Ford spokeswoman said on Wednesday the automaker is working very closely with the supplier to get production re-started. Ford on Monday said it idled F-150 production at its plant in Kansas City until May 14. Meanwhile, Super Duty production has been halted at Kentucky Truck and Ohio Assembly, although both of those plants continue to produce other vehicles and no workers have been laid off, Ford confirmed Wednesday. F-Series pickups generate most of Ford’s profits and Morgan Stanley recently estimated the value of the franchise as greater than that of the entire company. The truck line, including F-250 and other larger models, hauls in about $40 billion in annual revenue, exceeding the annual sales of companies such as Facebook Inc. and Nike Inc. The F-150 is so important to Ford that Albertine wrote that he is considering adjusting his earnings projections for the automaker once the full-impact of the supplier fire is known. “We do expect Ford will incur higher production costs during this shutdown period and potentially in the period immediately following the shutdown to the degree Ford elects to accelerate production to make up for this shortfall,” Albertine wrote in a note to investors. At the end of April, Ford had an 84-days supply of F-series pickups, according to AutoData. Even with heavy demand, the production stoppage would likely have to last for multiple weeks to dent those numbers. F-series sales in the U.S. rose 4.1 percent to 287,295 through April, according to the Automotive News Data Center. The supplier's fire is affecting other automakers. General Motors on Wednesday said it will temporarily halt production of its Chevrolet Express and GMC Savana full size vans at its Wentzville Assembly plant in Missouri because of a parts shortage resulting from the fire. It said the plant will continue building the Chevy Colorado and GMC Canyon midsize pickups. It did not say how long van production will be idled. Mercedes-Benz U.S. International Inc., in a statement released from its plant in Vance, Ala., said: "The damage caused at Meridian has caused a shortage of components used in our cockpits for some of our vehicles built at MBUSI. As a result, we have cancelled production shifts in certain areas and adjusted production hours for our team members this week. We continue to assess the situation and are working with Meridian to restore normal production levels." BMW, in a statement to Automotive News on Monday, said production of its X5 crossover will be affected Monday afternoon and evening. It said its plant South Carolina has an inventory of parts on hand. 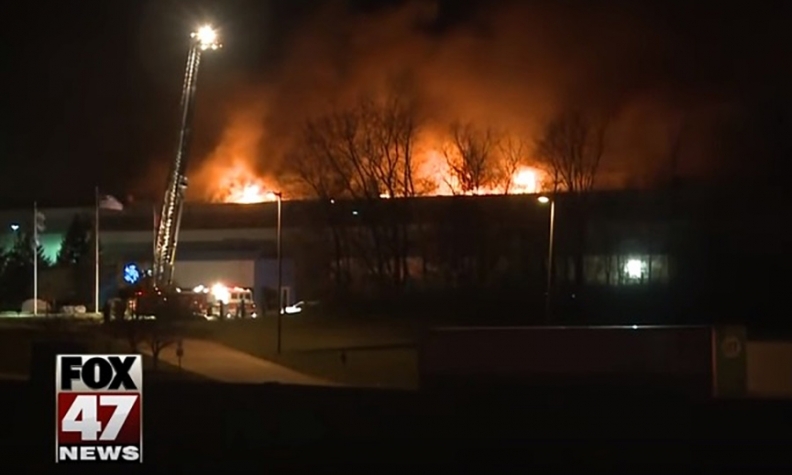 Meridian, in a statement released Wednesday, said the local fire marshal has been able to access the plant and the investigation continues. "We are currently following our safety protocols and working alongside state agencies and utilities to ensure that resumption of operations will be done in safe manner. Clean up and repairs are progressing," the statement said. "Finally, we are working with ALL of our customers to resume operations and supply as soon as possible. Safety will always be our primary concern. We will provide further information as soon as we are able." Meridian, in a previous statement, said it is working with its customers to move dies to its plants in Strathroy, Ontario, and the United Kingdom, Asher wrote, though the letter did not disclose the names of the customers. Meridian is owned by Chinese supplier Wanfeng Auto Holding Group. It also provides parts to Toyota Motor Corp., Honda Motor Co. and Tesla Inc. among others, according to the websites of Meridian and Wanfeng. Meridian makes aluminum and magnesium structural components at four plants in North America. Automakers use magnesium parts to cut weight in vehicles, and improve fuel economy. Bloomberg, Reuters, Michael Martinez and Automotive News staff contributed to this report.